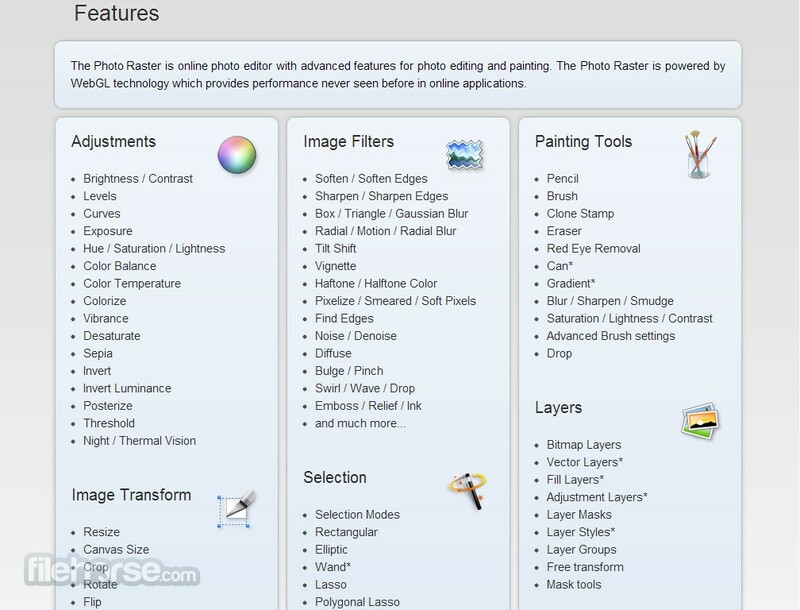 Photo Raster is one of the most powerful free image editors that you can find on the internet, and without a doubt one of the rare webapps that will satisfy not only novice users but also professionals. If you have ever used any professional and advanced photo editor on your PC or Mac, you will instantly feel comfortable when you load your image into Photo Raster. Painting tools, filters, layer editing, advanced selecting, layer masks, full assortment of brushes, retouching options, color adjustment options are only the beginning of the wide assortment of features that are present in Photo Raster. If you are away from your computer and you have to access advanced image photo editor, Photo Raster is perfect for you. You don’t need to install anything on your computer, just open your browser and access the power of cloud image editing where ever you are. In the previous several decades if you really want to get the serious work done with image manipulation and all forms of image and photo editing on your computer you had to take significant monetary hit and purchase some of the professional imager editing software, like Adobe Photoshop , Corel Draw or others. However, now many highly capable tools are created to be used directly from the browsers, enabling billions of people to get free access to incredible image editing tools that are focused not only on novices but also on professionals. Advanced Online Photo Editor just for you! One of the best professional-grade image-editing webapps is without any doubt Photo Raster, accessible for free even though it manages to easily emulate all the most popular capabilities of powerful editing suites like Adobe Photoshop. If you are interested in this kind of app, continue reading. 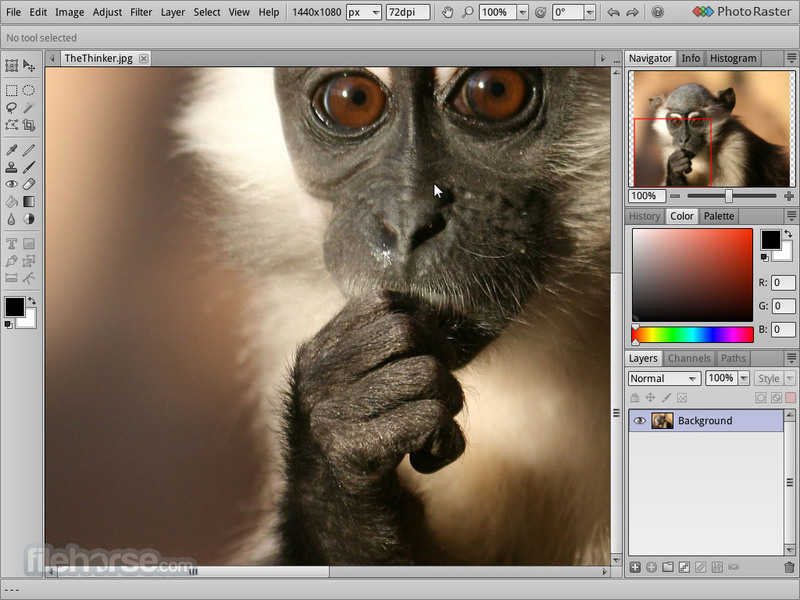 Photo Raster is a very special online photo editor that enables any computer user who has internet access and modern browser access to one of the most highly capable image editing webapps that exists today on the web. This advanced image editor supports everything that professional users would ever need to achieve full control over all of his image catalogue – array of painting tools for creating new art or for tweaking your current content, large catalogue of filters, color adjustment tools, full support for working with Layers and Masks, advanced area Selection tools, Transform tools (crop, mirror, rotate, resize, full support for layer manipulation, support for all the most popular image formats, and much, much more. This incredible array of features is available for every user for free, directly accessible from their web browser without the need for any plugin or add-on to be installed. Of course, every user get instant update to the latest version of the app, enabling them to instantly take advantage from any new tool or feature that is inserted into this already highly-capable image editing applications. To enable fastest performance, this app is powered not by Flash or HTML5, but by WebGL technology. 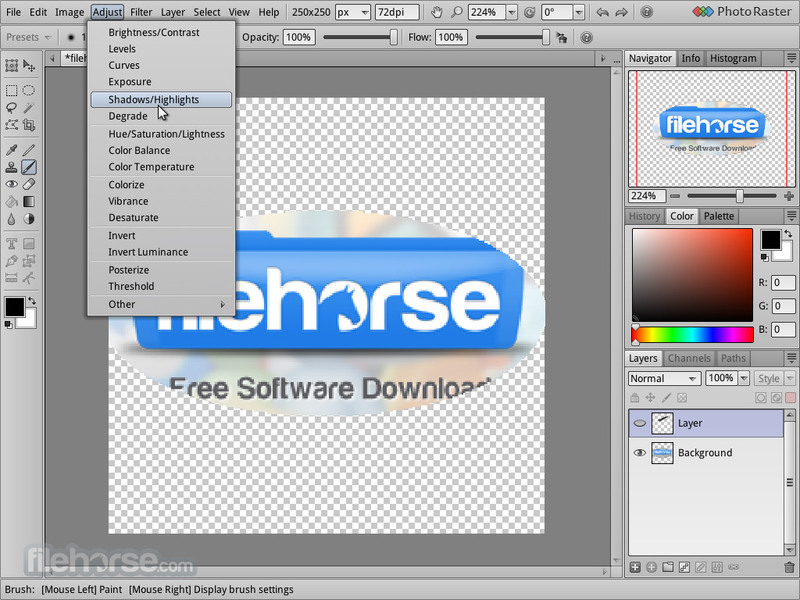 Using very attractive interface that closely emulates the look of Adobe Photoshop and many other professional image editing applications, Photo Raster manages to easily cater both novices who want to access highly capable tools for free and professionals who want to get the work done directly from their browser pages when they are on the move. If you have ever used or seen Photoshop, you will immediately see similarities between that incredibly popular program and Photo Raster. By maintaining similar UI and organization of tools, anyone who has worked with professional image editing applications will have zero issues in accessing and controlling every tool and feature Photo Raster offers. Amazing Advanced Online Photo Editor! 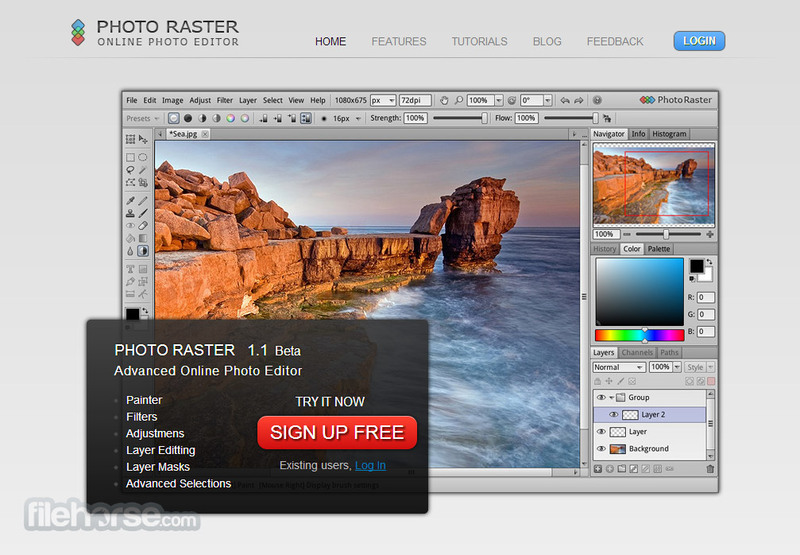 Photo Raster is 100% free, although it requires users to create free account before allowing them access to editor dashboard. As of early 2014 this app is in its “v1.3 Beta” stage, so its business model could change in future. By managing to so closely emulate Photoshop (both visually with the arrangement of its tool modules and other UI elements, and by functionality), users who decide to lessen the impact on their budgets can easily choose not to purchase Photoshop and use this tool on daily basis. The poweful paint tools support wide range of paint techniques including photo retouching. Compose images by mixing different image layers. Apply effects. Rich collections of the filters like soften, sharpen, denoise, stylise and many more.. The masks give you precise control over image or layer transparency. Control precisely which areas of the image are affected by tools. 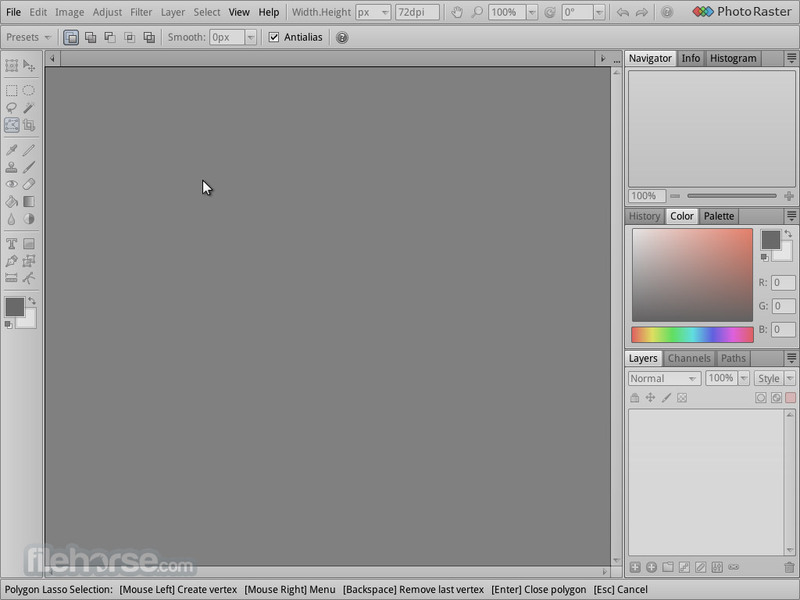 You can crop, resize, mirror or rotate image. You can do it also with layers or selections. You do not have to reinstall anything. The latest version is always ready for you. It does not matter if you use Windows, MacOS or Linux. It just works.